Do you provide business information and support? At Essential Business we work with all different types of people and organisations providing information and support to business owners… ranging from individual business advisers to large organisations who work with business owners all across the UK and abroad. Our ‘professional use’ customers use our guides, workbooks and courses to support them, whether they are working one-to-one with business start ups and people growing their businesses, advising many business owners, or training large groups of students or business start-ups. Our resources are flexible, user tested and award-winning. 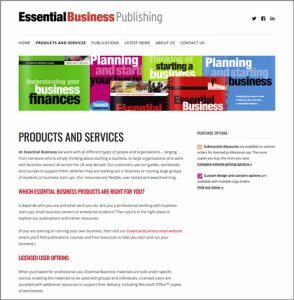 Visit our Essential Business Publishing website – this is the best place to start if you are a business support organisation, enterprise educator or provider of business information and support. Our Essential Business Publishing website provides more information about the publications and services available for professional use and shows how they can be tailored to fit your needs.